The best way to get to know a community is by scheduling a tour. See the facilities, meet the staff and residents, and get a feel first hand what it's like to live at Drake Terrace Assisted Living. Providing a peaceful environment for retirement living, Drake Terrace is an independent and assisted living community surrounded by landscaped grounds and walking paths. 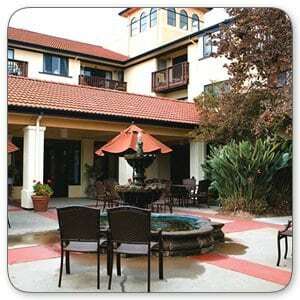 We are located close to both Northgate Mall Shopping Center and Kaiser San Rafael Medical Center in San Rafael. From our wellness programs to our many accommodations, our community offers the very best in senior living options. Specializing in full-service senior living since 1990, Kisco Senior Living is a company built on a foundation of integrity, dignity and compassion. With these values, we work to create environments that are inviting to our residents, their families and friends. Part of what makes Drake Terrace such a great place to live is our many activities and programs that address the physical, mental and emotional well being of our residents. Weekly activities include educational classes, exercise programs, trips to local destinations and even live entertainment. We have accommodations in all shapes and sizes, ranging from studios to one- and two-bedroom apartments. All of our accommodations feature air conditioning, and many feature kitchenettes or kitchens, patios, private garages and additional storage. In the center of our community is a private courtyard with a beautiful fountain, where residents can sit and socialize while enjoying the cool shade on warm days. All residences at Drake Terrace are provided with weekly housekeeping and linen services, as well as routine home maintenance. Scheduled transportation is available, and is a convenient way to go shopping, reach medical appointments or run personal errands. We encourage all of our residents to live as independently as possible. Sometimes our residents need an extra helping hand, and when they do, our staff members are ready and able to assist. Help with dressing, personal hygiene, medication management and other daily tasks is available, and all services are provided with privacy and care. Drake Terrace provides a relaxing and peaceful setting for individuals to enjoy independent and assisted living.